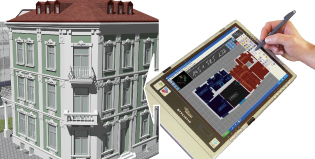 On-Site Survey is a modern system for recording buildings. All relevant building data is digitally recorded into ground plans on site. The building geometry recorded by means of a hand laser can be completed by photos, videos and spoken comments. All information can be entered directly into a portable computer. On-Site Survey is optimally suited for work with netbook or tablet PC. A netbook combined with On-Site Survey is the best priced electronic survey system with a full scope of supply. Comfortable and high-performance 2D and 3D direct interfaces are available for Allplan, AutoCAD and Glaser -isb cad. | Terms and conditions | Privacy | IRM Ltd. 2018. All right reserved.